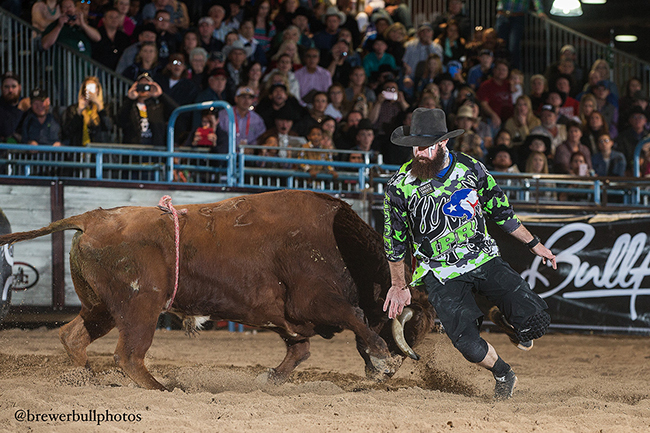 LAS VEGAS – It’s one down, one to go for Weston Rutkowski, who put on two strong bullfights Thursday afternoon to win the Roughy Cup for the second straight year. He and the other top 11 bullfighters will now advance to next week’s BFO Las Vegas Championship, which takes place Dec. 7-10 at the Hard Rock Hotel & Casino. Tickets are on sale now at HardRockHotel.com and AXS.com. It will feature a $50,000 purse and also include four qualifiers that will advance through competition that takes place at 3:30 p.m. Friday and Saturday at the Las Vegas Convention Center. The Roughy Cup was a four-round bullfight with the winners of each round advancing to the championship. Rutkowski, of Haskell, Texas, advanced out of the third set by posting an 86-point score. He was joined in the short round by Zach Call of Mullen, Neb., who won the opening round with an 82.5; Erick Schwindt of Lyons, Ore., who was 82 to win Round 4; and Nathan Harp of Tuttle, Okla., who posted an 89-point bullfight to win the second round, advancing through a tie-breaker after matching the same score posted by Wayne Ratley of Pauls Valley, Okla.
Then in the final round, Rutkowski put on a show with 12X and Costa Fighting Bulls’ Spitfire; the two athletes battled in the arena dirt for 93.5 points. For the victory, he pocketed $6,000 which moved him to the top spot on the money list in the race toward the world championship, the sport’s first true world title in more than 16 years. “We’re not done yet,” he said. He owns a lead of more than $3,000 over the No. 2 man, Nate Jestes of Douglas, Wyo., and has a chance to pad his lead next week at the Hard Rock Hotel & Casino. But he kicked off the BFO competition during a stellar contest Thursday afternoon. He captured the biggest payday because of the battle between he and Spitfire. On the bull’s initial move out of the chute, Rutkowski jumped the animal, which clipped the inside of the bullfighter’s leg. He hit the dirt but got right back up and took the fight to the bull. A few seconds later, Rutkowski was caught under the bull, between the horns and the animal’s front right leg, As other bullfighters jumped into the arena to divert the bull’s attention, the Texan scrambled back to his feet and finished the fight strong. “That big bull can hurt you when you’re down,” he said. “Luckily my boys were there to take care of me and get him off me and allow me to get back up and get back to work. This is a 60-second bullfight; just because he gets you down in 20 (seconds) doesn’t mean it’s over. You’ve got more time to finish. You’ve just got to keep your cool and your wits about you, and that goes back to putting in the work before you get here.